Our One to One Junior Golf Lessons and Coaching follow the same Holistic Framework we have for adults. 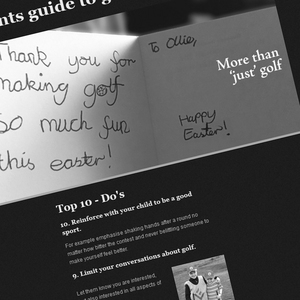 Whatever your level, we create bespoke lesson packages to ensure you get exactly what you need to improve. 5 - 17 Years Old? Can't make The Programme or Camp dates or times? Want to learn to play golf with your friends? Keen to compliment existing coaching? Private golf lessons for Juniors can be arranged on a One to One basis or in a Group setting. Please fill in the form below or contact us for more information. Please indicate the option of One to One Junior Coaching you want to arrange (booking is subject to availability). Thank you! We will get back to you ASAP with availability. A weekly Junior Coaching Programme, Junior Camps as well as a Parents Guide.